Most Japanese fountain pens are very boringly shaped, you can choose from endless quantities of black cigars. But the writing quality is often exquisite. If you can get anything other than a black Japanese fountain pen, then as far as I’m concerned it immediately becomes interesting. 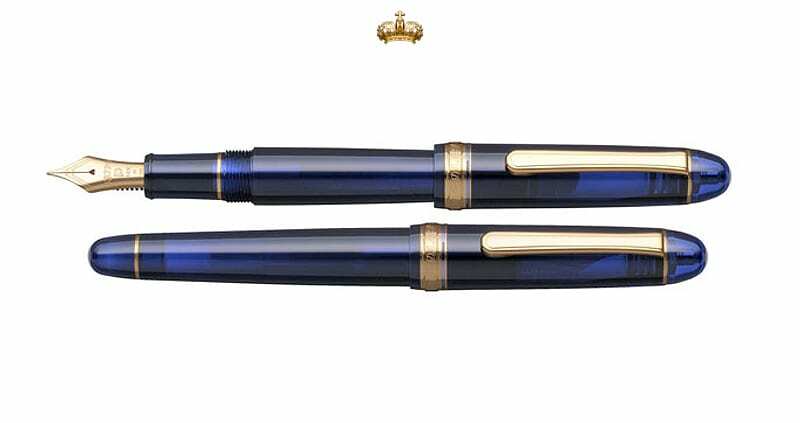 With the 3776 Century, Platinum has created a series of fountain pens that are beautifully coloured and semi-transparent. Fountain pens that are translucent have something special. In the past, special translucent editions were made called demonstrators. These were mainly intended to show how fountain pens work, but it soon became clear that fountain pen lovers find these “demonstrators” particularly attractive because you can easily see the amount of ink. That’s why nowadays more and more fountain pens are made from transparent materials. I also have a 10 countless demonstrators. Often you buy a completely transparent fountain pen first, without colour. With the wisdom I possess now, I would not recommend this to anyone. Ink has the property of sitting in all the small corners, with the result that you will have a completely transparent fountain pen that looks a bit messy anyway, see the photos at our review of the Sailor 1911. The Sailor is made of acrylic, the Platinum is made of deep blue noble resin. The somewhat darker coloured demonstrators remain much more beautiful to see. I find the Charles Blue and the Burgundy red the most beautiful colours, but sometimes there are also other colours available, such as the presently Nice Lilas. The shape of the Platinum 3776 Century is no real surprise. It is large, with the cap 14 cm, without cap 12 cm and quite thick, at the place you hold the pen to write this fountain pen is 1 cm thick. The pen is quite light, but due to its size it lies well in hand. The Platinum 3776 writes delicious, there is a 14K gold pen tip in it. The writing quality is really special. The pen tip glides smoothly over the paper so writing is a feast every time. Always pay attention to Japanese fountain pens. My Medium is similar to a Western Fine pen tip. 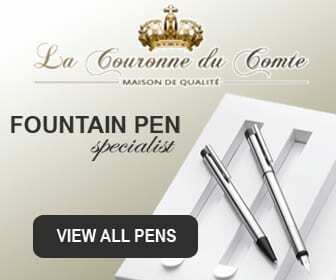 It’s a pen that has to become your favourite quite quickly. Once again, the clip is not surprisingly in shape, but it is of the highest quality, this pen remains stuck when you click it into your coat or blouse. Since its foundation in 1919, Platinum Pens has always had the goal of increasing writing comfort using modern technology. Platinum was the first manufacturer to invent a plastic filling system. Platinum is still innovative. For example, with the “Slip & Seal mechanism” in the cap, they managed to make an airtight screw cap for fountain pens. 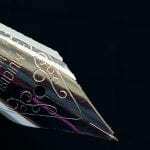 Normally air enters the cap and the nib which often results in dehydrated nibs, interruptions during writing and sometimes even damage to the filling system and nib. The “Slip & Seal mechanism” is an innovative system that uses a plastic tube on the inside of the cap with a powerful spring on it. 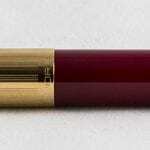 The main advantage of this system is that the fountain pen can be stored longer without drying out. It’s claimed that the ink is not even dried out after a year of storage. An additional advantage is that it also prevents leakage during flights. The Platinum 3776 can be filled with their own brand of ink cartridges or converter.